At just 23-years old, Santa Fe’s Joshua Montoya is already a true veteran of mixed martial arts. Actively competing for the past nine years, Montoya has dabbed his hands not only into mixed martial arts but into boxing and Jiu Jitsu competition. Representing his own academy, the Alchemy BJJ Head Coach is somewhat of an enigma in that he is young and has lots of years ahead of him but is very experienced in the fight game with so much history already laid down on his career path. Montoya’s MMA career started back in 2006 when he fought inside Santa Fe’s Genoveva Chavez Community Center for an amateur MMA bout as part of a fight card that also featured Donald Sanchez. In Montoya’s first professional fight more than a year later, he would fight on a Desert Extreme fight event that featured Rocky Ramirez, Angelo Sanchez and Cris Leyva. In his following bouts, Montoya would share the fight card with such notables as Floyd Sword, Frank Baca, Cody East making his professional debut and Will Campuzano. 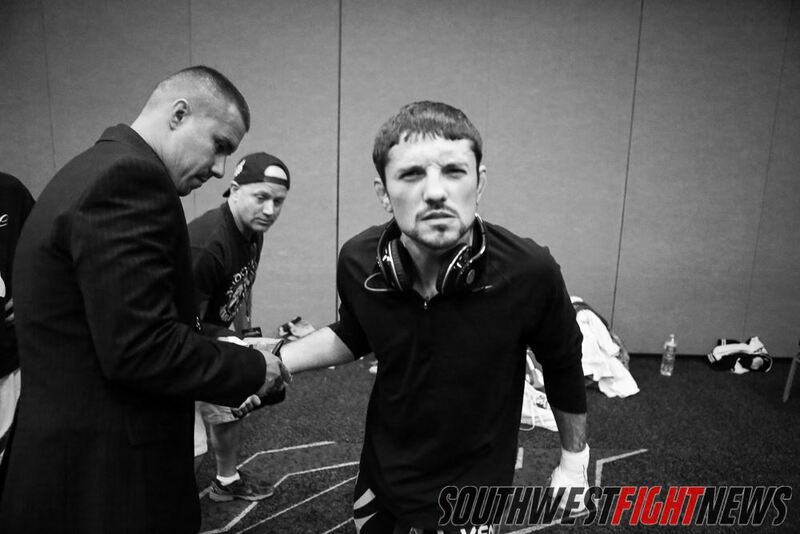 Ever the animated character, Montoya still in his young-20’s has become one of the most battle tested veterans in New Mexico’s MMA scene. His MMA career currently spans 20-career bouts of which nineteen are professional; three professional boxing matches and approximately 100-grappling matches. In 20-career MMA bouts, Montoya has spanned twelve promotions and in that fray has competed for Bellator MMA and the XFC. He has fought as far as New Jersey and as close to his backyard as physically possible. Needless to say, Montoya has been around the game for a very long time. In an effort to pay homage to Ring Magazine’s “The Best I’ve Faced” and Cage Potato’s “Unforgettable” series, we thought Montoya would be a great fighter to start our very own series that details a career retrospective detailing the greatest opponents a fighter has ever faced broken down in fighting attributes and characteristics. Best Wrestler: Jason Sampson, he was a collegiate wrestler. His wrestling was very aggressive and very dynamic. He was insanely strong for 135er and when he would shoot it felt like I got hit by a truck that would keep going forward even if I stuffed it. I fought Jason twice and each takedown felt exactly the same way. Best Boxing: Best boxer I have ever fought was Nate Vorel. That dude had some slick movement and very fast hands. Every time I would try to set something up there would be a double jab in my face. The guy hit hard too, I mean he hit like he was a 200-plus pound heavyweight. Heaviest Hands: Definitely Josh Huber of Colorado, he was a guy that when I looked at him, I did not think he possessed that type of knockout power but when he laid a right hand on my shoulder I knew that this dude had some serious power. Then he caught me with a straight right and all I could see was flashing. Toughest Chin: That has to be Daniel Armendariz, that dude could take a shot. Not only punches! He could take elbows and knees like I have never seen. I hit him with everything that I had and the dude was still fighting back. We went through a three round war and I had to finish him by arm-triangle in the third with about 20-seconds left because he would not go away with the strikes. Most Intelligent: I think the fighter that was the most intelligent was Abel Cullum. From the way he carried himself leading up to the fight and the way he acted after the fight, it showed me he knew how to be a real champion. The way he would answer questions when people would ask about the fight and his demeanor leading up really showcased it the best, he was also smart in the cage, I knew he has lots of different moves for me, one to counter everyone I had for him. It was as if I was playing against a seasoned chess player. Hardest Kicks: That would definitely be “Barata” (Rafael de Freitas). After the fight, I could not walk right for a couple of days! *Laughs* He had heavy legs and hard kicks, and they came fast. A flying knee wouldn’t be enough to finish opponent Frank Morris who Montoya described as the most surprising fighters he had ever faced off with. Best Ground Game: Jason Sampson, he was very well-trained on the ground. He had very good knowledge and understanding of his positions. Every time we would end up on the ground he was attacking with submissions. He was so smart, he would only go for stuff when he knew he could keep attacking from another position. He was also very strong and I think that comes from his wrestling base, to be able to move guys around where he wants them. Most Surprising: That would have to be Frank Morris who I fought back at a King of the Cage event. He was a 125ers so I was definitely larger then he was when we entered the cage that day but he didn’t fight like it. Frank caught me several times with spinning back fists and while they didn’t really rock me, they were part of how surprising Frank was. He was a brawler and he came to beat me. I hit him with a flying knee that didn’t even put him away. His toughness and his ability to roll with me a little on the mat added to the spinning back fists to make for one tough addition to the win column. Best Overall: I could go with so many. Ed West was good, so was Nate Vorel, Barata, and even a guy like Jose Villaneuva who I fought years ago. But I think I would say Jason Sampson, maybe it is because I have fought him for four rounds in our two bouts, but that guy is very talented. Not only was his wrestling powerful but I think he is even a Black Belt in Jiu Jitsu now, he was a Brown Belt when we fought and his grappling was very good. Not to mention he kicked hard and punched even harder. He was tough everywhere. When he was on top of me, when I was in top position and when we were standing, Jason was definitely the best overall fighter I have competed against. Sweetest Victory: Would have to be when I fought Jason Sampson, our rematch in his hometown in Dallas, Texas. I took the fight on two weeks notice and he already beat me three months prior to that by submission in Albuquerque. When they called me to take the fight, there was no hesitation on my part, I wanted to show everyone that I just made a mistake and I knew I could beat him in any part of the fight. Going into that fight, I knew it was going to be a tough challenge but if I focused on my game plan to stuff his takedowns, I knew I would have the advantage in the strategy part of the game. We ended up fighting all three rounds and the fight went to the judge’s and I thought in my mind, “no way would they give the decision to me knowing we were in his hometown”, when the ring announcer was reading the cards all I heard was “And the WINNER by split decision … Joshua Montoya!” That was my sweetest victory because I knew I could overcome any obstacle in front of me and I beat a great fighter in his hometown. That fight put me back where I needed to be in my career and quest in representing New Mexico. Most Bitter Defeat: Ed West. I felt like I really could have beaten him. I learned a lot from that fight about following a game plan and sticking to what I do best and that is to impose my will on people and break them, destroy them. I should have taken him down off of the fence and made him feel my pressure being on top of him to let him know that it was my ground game that got me this far. The way I moved past the defeat was getting back on the mats and feeling comfortable in my ground game again. I left what I fell in love with in the first place and started to focus on my kickboxing. But as I learned in the West fight is that I needed to be a well-rounded fighter. I love wrestling and Jiu Jitsu and that’s why I even started my career.